There are more and more iPhone and iPad users nowadays. And communication has become easier and more convenient as numerous messaging apps emerging in app stores. It is difficult to pick up the best one when you are faced with so many choices. 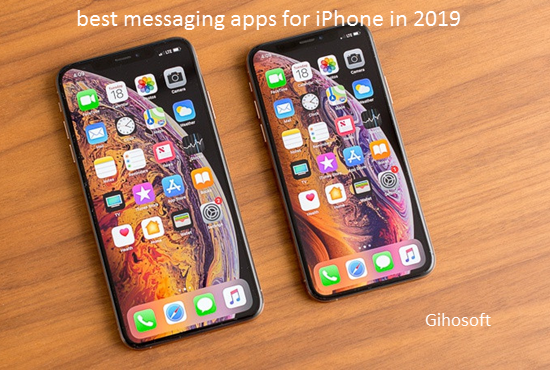 This article has listed top 8 best free text apps for iOS device which are safe , clean and have powerful functions and will help you find one free text app you really need. Bonus tips: It is an amusement to chat with your family and friends through the messaging app on iPhone. But it is really a pain when you lose vital messages and message attachments accidentally. Don’t be anxious. Gihosoft iPhone Data Recovery will give you a chance to retrieve them with or without backup. There is no doubt that WhatsApp is one of the best iPhone messaging apps. It is a popular cross-platform application which can be used not only on iOS device but also on Android, windows phone, Symbian and Blackberry. Once you download this program, you can freely chat with your friends who also use it as you can send one million messages to your friends within one day. And it charges no international fee. WhatsApp, as one of the best texting apps for iPhone, can also help send videos, pictures and voice files to your friends. (If you want to send or save the video files, you need to use iPhone). Furthermore, WhatsApp enables you to send your location, documents, pictures, videos and messages. It just recently adds some new features like allowing users to lock voice recording and watch YouTube within the chat interface. Signal is a fantastic chatting software which has a rating of 4.6 in the app store. With Signal, you can communicate instantly while avoid SMS fees. You are able to create groups so that you can chat in real-time with all of your friends at once. In this era of the Internet, people value their privacy very much. Signal has a strong sense of confidentiality. Media and other files can be shared with complete privacy there. And the server never has access to any of your communication and never stores any of your data. Signal is the best messaging app we heartily recommended to those who pay great attention to the privacy of individual. Are you looking for an excellent messaging and socializing app for iPhone? Wechat is one of the best choices. You can use text message, voice, video and stickers to keep in touch with your family and friends. The stickers not only can be downloaded online but also can be made by yourself, which is really funny. You can get a large number of news with high quality through browsing millions of official accounts in this app. Mini programs provide third-party service to you. In Wechat, you can also play phone games together with your friends, which makes it a nice tool to enhance your friendship. Wechat payment service is another highlight of this app. So far, Wechat is more than just a software, it has become some kind of life style which has influenced around one billion of users all over the world. There are many other great and useful functions in Wechat, and if you are interested in them, why not try installing this app? Hangout is a messaging app from Google. It allows you to chat with other people on a computer, iPhone or iPad. Google Hangout supports group conversation and you can connect with your friends anytime through free voice and voice calls. If you are using Google Hangout, it is free for you to call other Hangout users. Integrated with Google map, Google hangout lets you share your location with others from the app directly. You can also share your recent photos and videos. Cute stickers and emoji in this app make your conversations more lively and interesting. However, there is not just advantages of this app. The alert sounds in Google hangout cannot be customized per contact and it has no built-in Gift gallery. Anyway, it is still one of the best messaging apps welcomed by iPhone users. Another one of the best texting apps for iOS device is the Facebook Messenger. Facebook messenger users can send messages to anyone with no phone number needed. Besides messages, links, image, voice and videos can also be sent to your family and friends in different places. Pure text chat may be boring, but the GIFs, stickers and chat color in this app will make the chat creative and enjoyable. And you can share your real-time photos and location on this platform and keep up with your friends. Moreover, Facebook messenger provides a lot of game, where you can fight with your friends and discover more funny games you like. Telegram is a pure instant messenger that promises fast and secure messages. It delivers messages faster than any other application. Everything sent by Telegram, including chats, groups,media, etc. are heavily encrypted and can self-destruct. Telegram protects your messages from hacker attacks and it is a reliable texting app for iPhone. As it is a cloud-based messaging service, it lets you access your messages from all your devices at once. Your data are stored in the cloud and you will never lose them. The way the app looks can be changed as you like as there are different themes on it. But there is a flaw of this app that it seems easy to attract lots of spam messages, according to the users’ feedback. Viber is another one of the best messaging apps for iPhone. Viber is of simplicity. You can create your account simply with your telephone number. Messages, photos, videos and many other things can be sent without charging any fee. You can also make free audio and video calls with family and friends. What’s more, with various stickers for scenes, you are able to express emotion more freely and vividly. Line is a free instant communication software on electronic devices such as iPhone. You can use the Line to do one-to-one or group chats with your friends anywhere. Free voice and video calls, domestically or internationally are available with the Line. This app adds a social entertainment layer with its networking and gaming features. But the premium sticker, themes and games it offers charge a fee. Apart from messaging, Line also provides various services like digital wallet, news stream,etc. All above is the top 8 best messaging applications we summarize for iPhone users. Have you learned more for messaging apps on iPhone? And have you picked up any one you prefer? If you have any other better messaging apps for iPhone, please share it with us.